Dan Burn has revealed he is not sure where he will be playing in January. 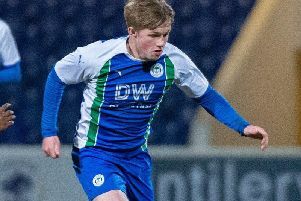 The towering defender signed for Premier League side Brighton during the summer transfer window, before being loaned back to Latics until January. But Burn admits there may be scope to adjust that arrangement, leaving him to stay longer at the Championship club. He said: “I don’t really know what’s going to happen in January. “As far as I know I’m here until then and then going down to Brighton, but that’s up to the clubs. “I’m sure they’ll come to the right decision and I’m happy with whatever that is.” Burn made his first league start of the campaign during the 1-0 win over West Brom last weekend after coming off the bench in the defeat to Preston the week before. He had missed previous matches due to a broken bone in his foot sustained during the pre-season. for a Premier League outfit. Burn was again in the starting line-up for Tuesday’s loss to Millwall, and before then labelled their upcoming run of fixtures, starting at Sheffield United tomorrow, as ‘massive’. “We’re not scared of anyone in this league, we’ve played most of the big teams and we’ve come away with some really good results,” he said. “But it’s such a tough, competitive league, anyone can beat anyone on the day, and we need to take each game as it comes. When he does move south though, Burn thinks his new role on the left could put him in good shape to force his way into the Brighton side. “I’ve been speaking to a few people and the best way of getting into the Brighton team would be on the left-hand side of a back three,” he explained. “There’s two good centre-backs there, and it’s something I’d like to add in my game.